The IC36 Combi gas boiler is a condensing boiler that comes with a variety of features and benefits. This highly reliable boiler has been designed and manufactured by ATAG and is a compact, wall-mounted unit that will help to save you some much needed space around your home. Thanks to dimensions of 700mm x 440mm x 355mm (hxwxd), it can comfortably fit into a standard kitchen cupboard so that it’s out of sight and out of mind. This is a highly efficient boiler, shown by its seasonal efficiency rating of 94% and ErP A rating. An output rating of 36kW makes the unit ideal for larger homes that have a high demand for heating and hot water, as well as homes with multiple bathrooms. Also available in the range are models with output ratings of 24kW, 28kW and 40kW, meaning that there’s a unit for just about any home. As a Combi boiler, it supplies instant heating and hot water by using the mains water supply, so you don’t need to have any bulky tanks or cylinders. Within this compact Combi is a host of features, such as a lifetime replacement guarantee on the iCon heat exchanger, instant hot water with pre-heat facility and an outside weather compensator as standard so that it’s able to change its heating to suit the weather outside. 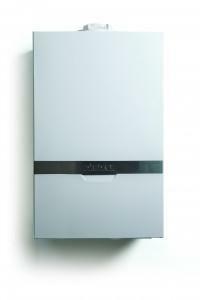 Plus, by installing this boiler, you could potentially start saving £320 a year on your energy bills. As well as all of this, the boiler features a 10 year warranty as standard so you can have peace of mind that it won’t let you down.